Respect to the painted cow! Well, well! If it isn't Scooter's first (and, so far, only) #1 hit in their homeland of Germany! (Actually, it was a Top 5 hit in other countries as well.) 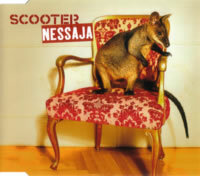 "Nessaja" is one of the songs that have come to identify Scooter, and it has been played at pretty much every concert since 2002. It was also the first song (and subsequent music video) to feature new third member (at the time) Jay Frog. Nessaja also serves as the epitome of what Scooter has been known for, aside from psychadelic videos in their earlier days: loud stadium techno music. Although they have deviated significantly from this sound as of late, it's their forte, and Nessaja shows us why. Nessaja's Radio Edit demonstrates this well. It has all the elements of a powerful Scooter single: a surprisingly catchy high-pitched voice chorus, amazingly forceful shouts from the lead MC, H.P. (including a now legendary one about the "painted cow", alongside many other truly nonsensical ones), strong synths, and a neat bassline that could potentially cause your pancreas to shiver. All this creates quite a powerful and energetic track, one that would make any concert-goer go ape. The chorus is actually based on the lyrics of the song "Nessaja" from the 1983 German children's cartoon, "Tabaluga". Tabaluga is a green dragon from Greenland who gets into all sorts of mischief; Nessaja is the name of Tabaluga's turtle mentor. Typical children's fare, but even better fodder for a Scooter single! The Extended mix is the Radio Edit with more of a build-up in preparation for some seriously rockin'. The Ultimate Club Mix is not quite as ultimate as it makes itself out to be, bringing to the table an even more extended mix but without H.P. shouts, suitable for clubbing. And, in an odd twist, the B-Side this time is Shortbread, a relatively somber trance number that slowly builds up with a haunting melody, working its way toward acoustic guitar samples before a break of even more melancholy pads. It's a sweet way to end the disc, to be honest. It's evident, at least to me, that Nessaja rightfully stands as one of Scooter's most shining moments in their long history. It's a shame that the different versions here lack significant variety here, but at least we get a completely different and polar opposite B-Side to compliment the high-energy approach of the title track. If you're looking for Scooter at their peak, this may be the place to find them.